It was only a matter of time before someone asked me to build one of these guys. Since posting my first one and The Dark Fortress graciously adding it to his gallery, I've gotten a few requests for how I built him. Actually the leg armour more than the shoulders since I've already got a tutorial for those here. This guy is actually an improvement over my first since I stylised his leg plates a little more than I did on my first model. For this guy, I'm using a regular plastic terminator for the base. The first step is to clean the legs of any icons, purity seals and everything else. 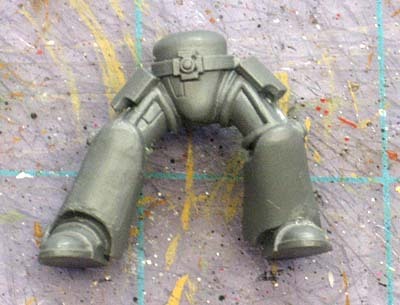 You also need to trim off the knee bolt on the sides of the knees too. 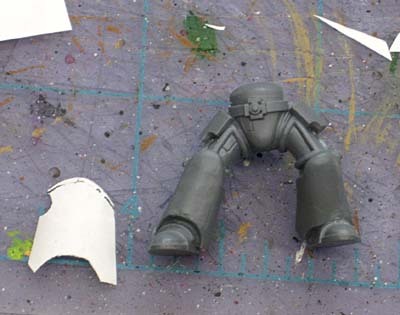 With the legs cleaned off, you can start making the templates for the model. 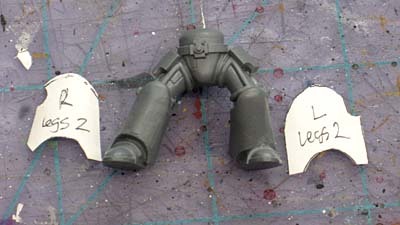 Each pair of legs will require a unique template. 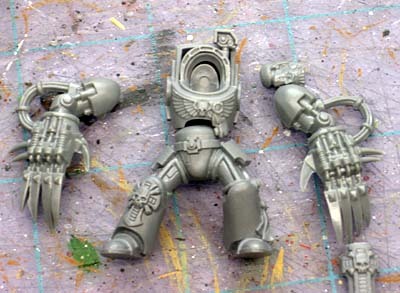 So... if you're looking to do this for a full 5 man Terminator squad, you'll end up making 5 pairs of templates. One for each set of legs. Making the templates is a matter of trial and error. 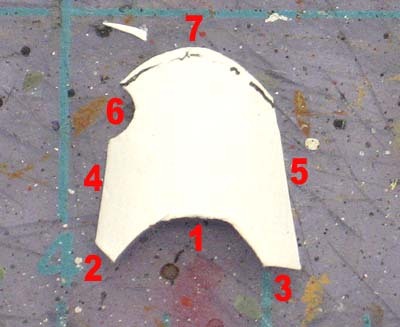 Start out with a small piece of paper to get the right shape first. Then you can transfer that shape to your cardstock. I've marked the order I go in when I'm making my cuts. I make one cut and test fit it. If it needs changing, I modify it a little and then test fit it again. Once that cut is good, I go on to the next cut and so on to the end. Once you get the hang of it, it shouldn't take much more than 3 minutes to make a single leg template. If you mess up, just trace the part of the template that is good onto another piece of paper and start over again from the point you made the mistake. You can see that each leg is different. You won't be able to use any shortcuts anywhere. Each one is custom. Believe me, it's easier to just make each one individually than it is to try and take a previous one and make it fit another style leg. 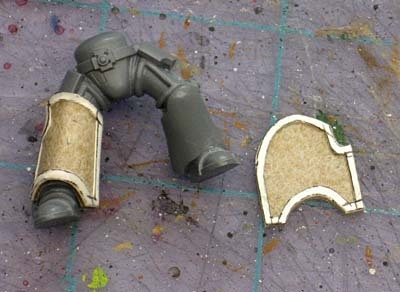 Actually making the leg plates is done the same way as the shoulderpads. Here's the whole process instead of retyping it all here. Once you have them made, you can shape them just like the shoulderpads except these are even easier since they don't require as sharp a curve as the shoulderpads do. Once you have it bent to shape, just glue it in place. There may be some shrinking due to the glue and bending them so if you're real particular about where edges meet up, you might want to add an extra millimeter or two all the way around your template to account for the shrinking. I have to ask where did you get the lightning claws from? The claws come from the plastic Chaos Terminator Lord. what materials did u use to make the armour? From there you could even draw onto the template with a graphics program, print them off with some nice designs for freehand. yer, could u please do that? 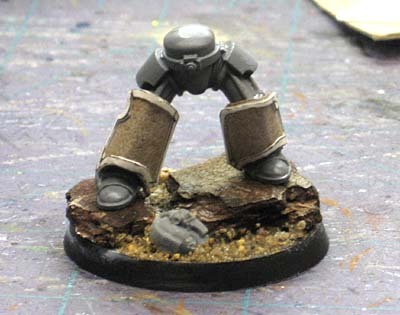 btw, could u scan the leg templates as well so i know what size they should be? 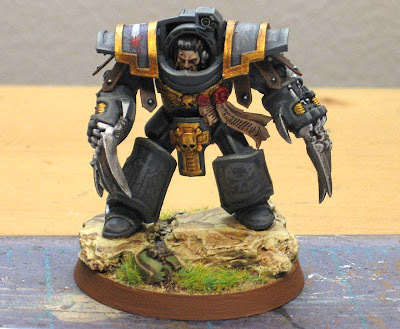 Sorry guys, I would need to make individual templates for each individual terminator and I would need a complete boxed set to work from... and I don't happen to have a spare boxed set lying around. Until then, you'll just have to scratchbuild your own versions using the same process I did. Anon: They are made with poasterboard and cereal box cardstock. What model did you get the arms from for the one shown in the pictures? Craig: They come from the plastic Chaos Lord model.